The August 4 act was the lynchpin, laying out the specific amounts of state debt to be absorbed by the federal government, along with the fiscal scheme making it possible. Most of the debt had originally been held by ordinary citizens, but the payment arrangement was a boon to speculators, who had bought the worthless paper notes for pennies on the dollar. Though “rewarding” speculators was very unpopular, Hamilton recognized that it would ultimately lower the cost of debt by publicizing that the new government would always honor its bills. The Assumption Plan, the bedrock of Hamilton’s financial strategy, laid out the specific amounts of state debt to be absorbed by the federal government, along with the fiscal scheme making it possible. Most of the debt had originally been held by ordinary citizens. Since the end of the Revolution, however, speculators had bought paper notes for pennies on the dollar and taken on the majority of the federal debt notes. The confederation government had not kept records of the original holders of debt, and there was no way of verifying—after 1787—that the desperate veterans and citizens who had sold their claims to speculators had been the original holders. Hamilton, who knew that paper notes would need to be paid in full to their current holders if the nation were to establish its credit-worthiness, was accused of “rewarding” speculators. This had several consequences for the new government. It publicized that the U.S. financial system would honor its bills, reward risk, and give the holders of the now-federal debt a stake in the new government’s success. It also, however, fueled tensions between those rising in wealth and power under the new federal government and those who felt left behind by the new economic reality, a group that included many disillusioned Revolutionary War veterans. “Be it enacted by the Senate and House of Representatives of the United States of America in Congress assembled, That reserving out of the monies which have arisen since the last day of December last past, and which shall hereafter arise from the duties on goods, wares and merchandise imported into the United States, and on the tonnage of ships or vessels, the yearly sum of six hundred thousand 600,000 dollars annually for support of government…. Aug 7: House “Debate on the Amendment of the Senate to the Funding Bill, to assume a part of the State Debts,”noting that “A message was received from the President of the United States, informing the House that the act to provide more effectually for settling the accounts between the United States and the individual states had received his consent”; Aug 14: President Washington’s Proclamation“of a Treaty of Peace and Friendship between the United States of America and the Creek Nation of Indians,” signed by Washington on August 13, 1790; Aug. 21: House “Debates on the amendment of the Senate to the Funding Bill, to assume a part of the State Debts”; Aug. 28: House “Debates on the amendment of the Senate to the Funding Bill, to assume a part of the State Debts” continued. While his First Report was debated in Congress, Hamilton became more determined to place the new nation on firm financial ground. Jefferson, Hamilton’s greatest ideological rival in Washington’s cabinet, resolutely disputed Hamilton’s proposals. Jefferson feared that the Assumption Plan would make the federal government too powerful, would dangerously cement the centralization of financial power in the Northeast, and penalize Virginia and other Southern states that had already paid most of their war debts. Both statesmen, seeking a pragmatic resolution, compromised in June of 1790. In exchange for moving the future national capital south to a site on the banks of the Potomac River, and for reducing Virginia’s net payments to the government to zero, Jefferson agreed to work with Southern legislators on behalf of Hamilton’s Assumption Plan. Their compromise, the Residence Act, passed Congress on July 16, 1790, two weeks ahead of Hamilton’s Assumption Plan. The Residence Act provided that Congress would move from New York to Philadelphia in December 1790, then to the permanent capital on the Potomac River in the year 1800. 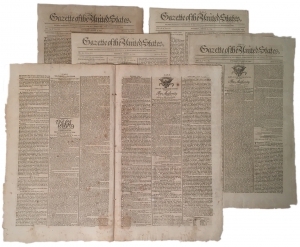 The issue of the Gazette offered here also includes: A lengthy Committee of the Whole “Sketch of the Debate on the Residence Bill”; A report noting that President Washington had informed Congress of his consent to the bill; An announcement that “The Resolution for assuming the State debts was agreed to in the Senate by a majority of two”; House debates over the “Post Office Bill” and postage on newspapers; Lengthy report from Marseilles: “Citizens … attacked the citadel of that place” (Fort St. Jean) on May 2, demanding its surrender. The soldiers responded with cannon shot, and the citizens mounted another attack; 417 people were reported killed, including the fort’s commander.